The restaurant is two stories and we sat upstairs which overlooks the first floor dining area. 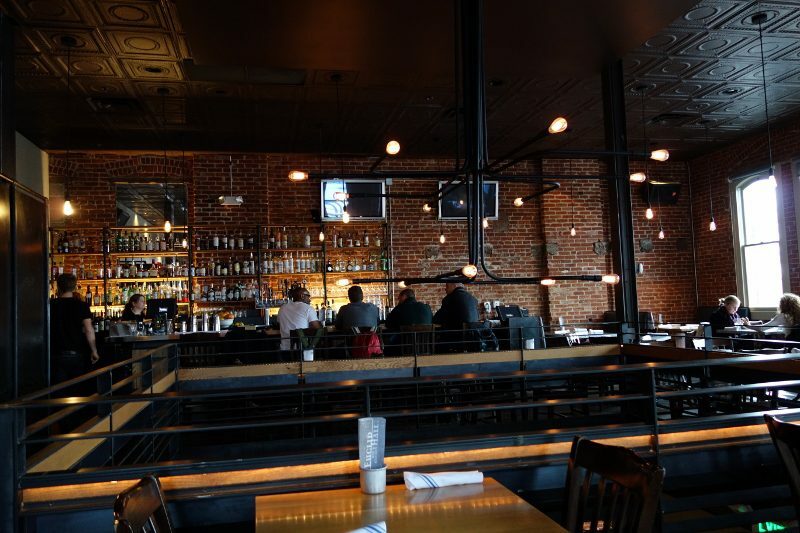 The exposed brick and high ceilings, combined with the casual vibe and friendly staff, made the restaurant inviting and comfortable, especially on this cold, snowy night. The elevated pub menu offers a great selection of housemade sausages, po’ boys, poutine and schnitzels and we got down to business. 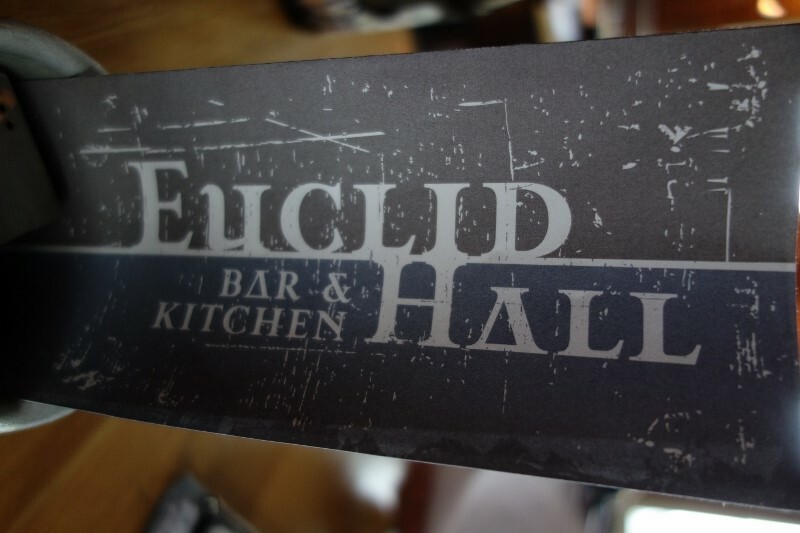 Featuring a “crafted, not cranked out” food menu, Euclid Hall has a lot of fun in how they describe the dishes. 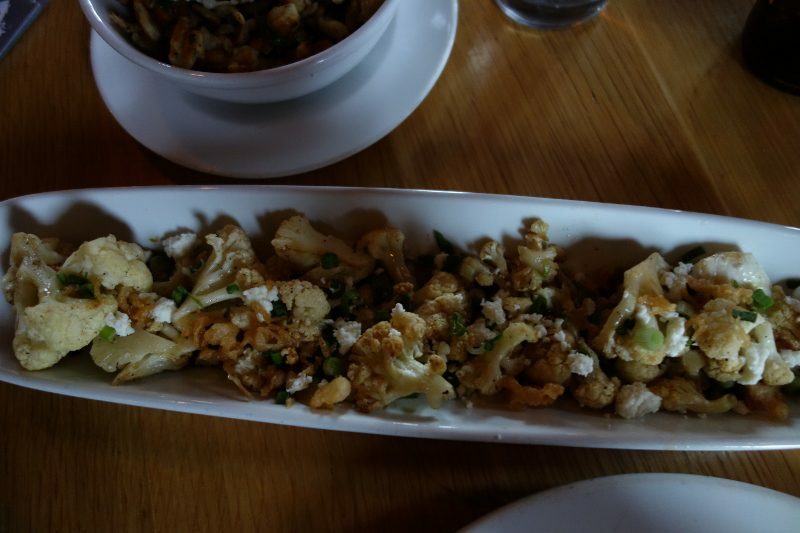 From the [Because We Have To] Section, we ordered the Roasted Caulifower Salad (Haystack goat cheese, shishito pepper marmalade, scallions, tempura crunchies) – Perfectly roasted with flavors ranging from smoky to sweet with a kick of heat, even if you don’t love cauliflower, this dish will change your mind. The Fried Cheddar Curds with buffalo ranch were tempting but as there were only two of us, we had to limit our choices. We didn’t order anything from the [Because We Want To] Section, which offered a cheese plate, an Itsy Bitsy Fishwich and raw oysters or from the [Because We Can] Section which included Pad Thai Pig Ears, Bruléed Center Cut Beef Marrow Bones and Foie Gras. It wasn’t for lack of desire but rather because there were just too many good things on the menu to try! Next up, the [Poutines] Section offers a loose interpretation of the classic Canadian dish of fries, gravy and cheese curds. 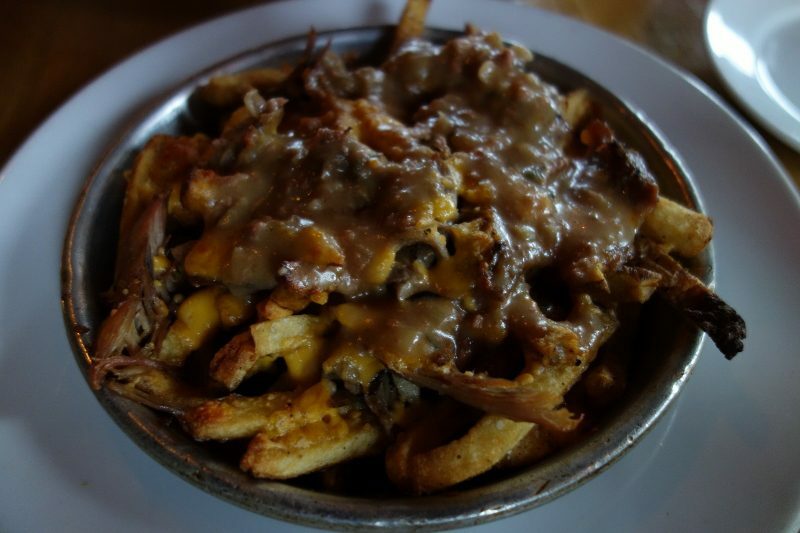 If you like fries, salt and and tender duck confit, the Duck Confit Poutine, with duck gravy, black pepper, cheddar curds, is rich and full of flavor and worth every calorie. 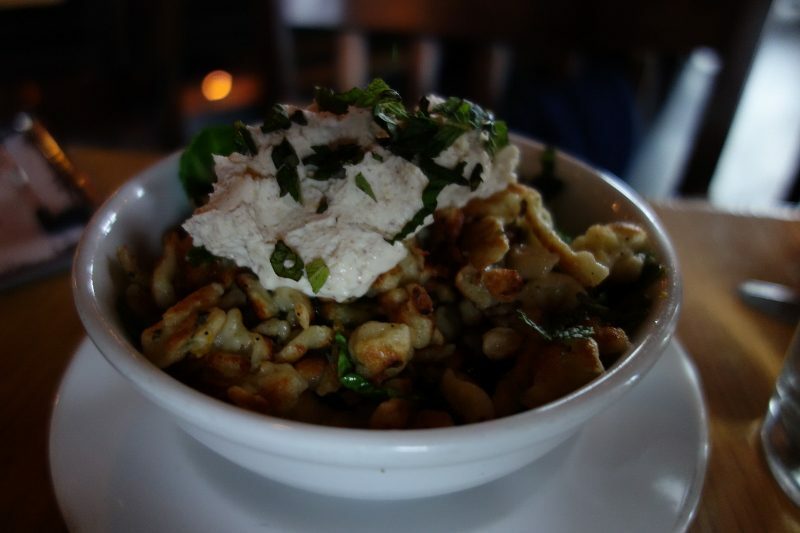 From the [Sides, Veggies, Starch, Roughage] Section, we selected the Lemon and Coriander Spatzle which despite the implied heaviness of the spatzle and cheese on top, the lemon lighted the dish and added a great note of acidity. As if we hadn’t had enough, we also ordered the Sausage Tasting from the [Fresh Hand Cranked Sausage] Section. 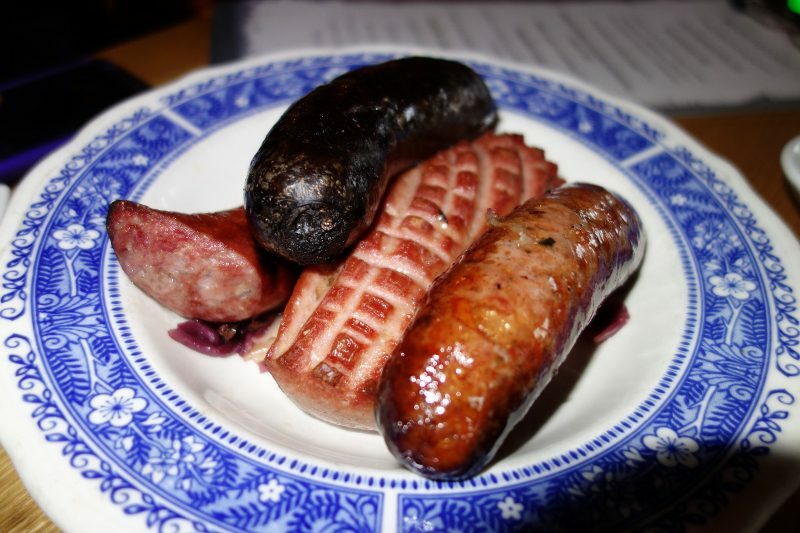 In this tasting, we got to taste all four sausages on the menu: Beef Short Rib Kielbasa, Leberkäse (a silky smooth Bavarian classic sausage made with cow and pig), Boudin Noir (with curry and eggplant) and the Butcher’s Choice Sausage. 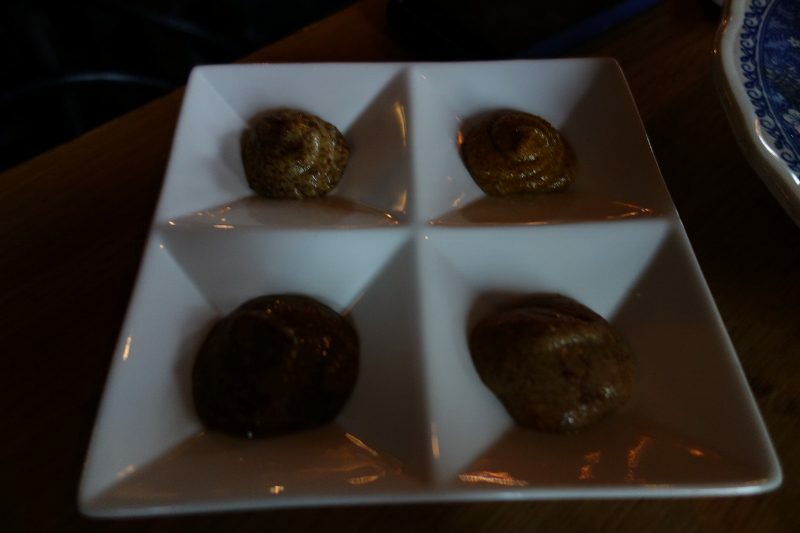 The sausages are all ground, seasoned and cased in house and we paired them with four hand-ground, house-cured mustards. Not normally a huge fan of sausages, these were delicious, fresh, full of flavor and had a great texture. Euclid Hall offers an extensive beer selection and creative cocktails but after a day of wine tasting, we decided to focus on the desserts instead. Although we were full, we couldn’t resist two desserts from the [Desserts] Section. 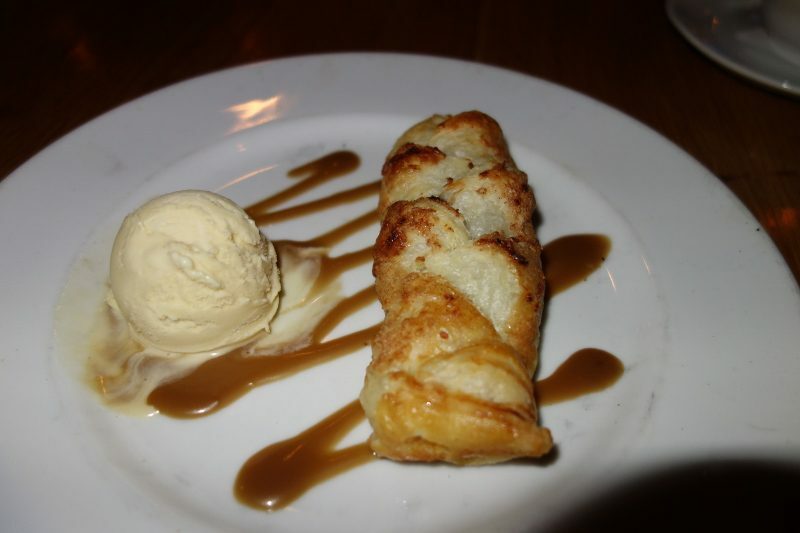 The Smoked Chocolate Stuffed Strudel with malted ice cream, stout toffee caramel, hazelnut brittle was sweet and savory and every drop of the stout toffee caramel was scrapped off the plate. 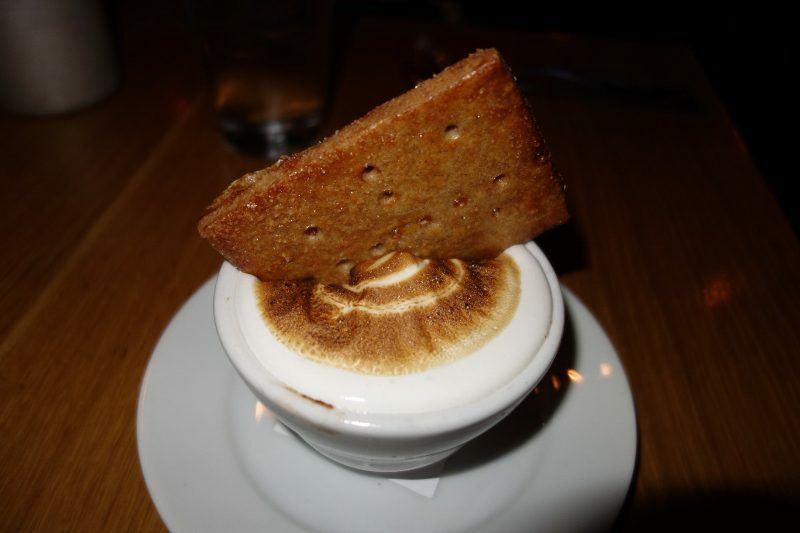 And the S’mores Pot de Crème with house made graham crackers and marshmallows was ooey-gooey goodness. This entry was posted in Food and tagged Beth Gruitch, Colorado, Denver, Duck Confit Poutine, Euclid Hall, Euclid Hall Bar and Kitchen, Fresh Hand Cranked Sausage, Historic Larimer Square, Jennifer Jasinski, Lemon and Coriander Spatzle, Poutines, Roasted Caulifower Salad, S'mores Pot de Crème, Sausage Tasting, Smoked Chocolate Stuffed Strudel by Allison Levine.